Ipswich boss Mick McCarthy said none of his fringe players had given him a selection "headache" after the FA Cup replay defeat by League Two Portsmouth. McCarthy's Championship side lost 2-1 at Fratton Park after he made 11 changes to his starting line-up. "It's confirmed to me what I probably already know, which is the best side is the one that has been playing. "I thought Portsmouth played well and deserved to win and I think we've given barmy goals away," said McCarthy. He told BBC Radio Suffolk: "You're never going to play against anybody if you give goals like that away." "We gave a penalty away and then we didn't defend a cross which is pretty routine actually." Gary Roberts put Portsmouth ahead from the penalty spot after he was fouled by Piotr Malarczyk before unmarked Marc McNulty headed in the League Two side's second. 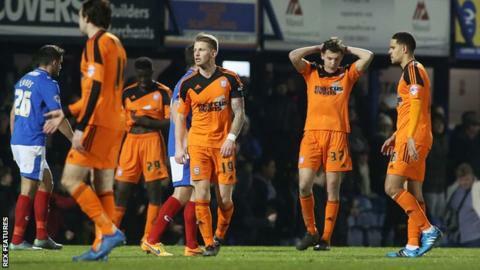 Malarczyk was later sent off after Ainsley Maitland-Niles had pulled a goal back as Ipswich lost against lower-ranked opposition in the FA Cup for the third time in a row. "To have a chance of being in the play-offs I need the best team playing week in, week out," added McCarthy. "Did any of them [playing against Portsmouth] give me a problem about picking my team over the next few weeks? I don't think so, no but I know the ones who are capable of playing."